This temple is built on the site of the former Tatsunokuchi Execution Ground in Kanagawa Prefecture. The 5-storey pagoda, which is the only orthodox wooden building of its type in the prefecture, as well as the temple's main building, are both regarded as amongst the top 100 pieces of architecture in Kanagawa. At approximately 2AM on the morning of September 13th 1271, Nichiren (*1), an outspoken critic of the Kamakura Shogunate, was brought to Tatsunokuchi (*2) Execution Ground, and was just seconds away from execution. Just at that crucial moment, a large bright light resembling the full moon appeared in the skies above Enoshima, blinding the executioners and saving Nichiren's life. Of all the perpetrators consigned to Tatsunokuchi, Nichiren was the only survivor, making this apparent piece of divine intervention very special. This has since become known as "The Tatsunokuchi Persecution". After Nichiren (1222 - 1282) died, his follower, a man named Nippo, built a sacred site in 1337 to the Tatsunokuchi Persecution, and inside this building he enshrined a statue that he had made of Nichiren, as well as the stone (*3) execution seat used in Nichiren's halted execution. This building was the beginning of Jakko-san Ryuko-ji Temple. The 5-storey pagoda, which is the only orthodox wooden building of its type in the prefecture, as well as the temple's main building, are both regarded as amongst the top 100 pieces of architecture in Kanagawa. 1. 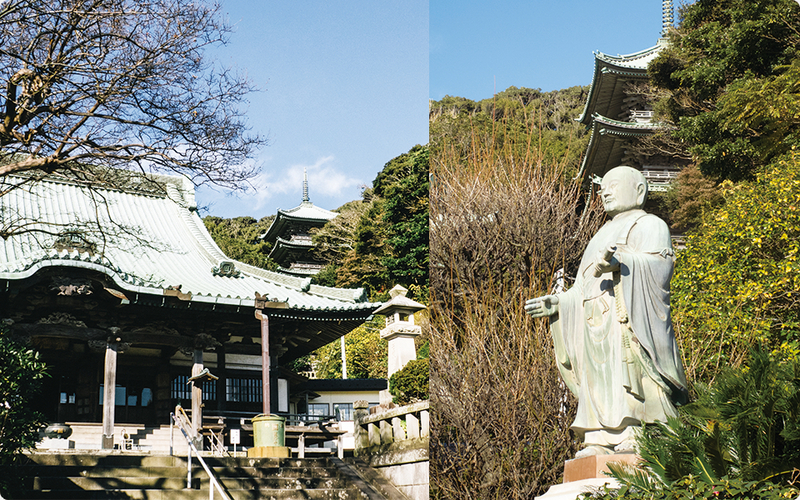 Nichiren was a Buddhist monk during the Kamakura Period. He was the founder of the Nichiren (or Hokke) Sect of Kamakura Buddhism. 2. At the time, Tatsunokuchi was an execution ground where perpetrators were brought and beheaded. 3. A cushion-shaped stone covered in animal skin that was used as a seat during executions.